If you enjoy grilling, then you will know that grills can quickly become greasy after continued use. The best way to clean them is by using a proper grill brush, which is specially designed to clean grills in the easiest way possible! Many BBQ enthusiasts use grill brushes to clean their grill after every use in order to avoid any build up of grease. It is important to use a brush which can reach between the coils and into the hard to reach areas of the grill in order to keep it clean for a long time. Grill brushes come in all shapes and sizes, some with bristles, and others with no bristles, and if you are new to the grilling world, you may not know which style works best for your grill. Perhaps you would like to know more about grill brushes and even purchase one for your grill? If this sounds like you, then sit back and read this article as we have got you covered! We will show you a few pointers to look out for when purchasing a new grill brush, as well as a product review on a really good quality brush – the nylon bristle grill brush by Char-Broil. When it comes to purchasing a grill brush, there are a couple of factors to take into consideration. If you have ever tried to clean a grill with a short handled brush, you will know the importance of having a brush with a long handle. Most people will actually turn the grill on before cleaning to heat up the grease as this makes it easier to remove. Therefore, if you are using a short handled brush, your chances of getting burned from coming into contact with the cooking surface is high. Instead, try to opt for brushes with a longer handle, at least 6 inches or more. Many grill brushes will come with metal loops or material on the end of the handle so that they can easily be hung up. These are the best styles to go for as they can easily be placed in a spot and you won’t lose or forget them. Therefore, you should place a hook in your shed or other storage location so you can store your grill brush. When you start shopping for grill brushes you will quickly begin to notice there are a few different varieties available. Bristle brushes will have sturdy bristles, usually made of stainless steel, and which are easy to remove the grime and grease on your grill. The only problem when it comes to this style is if you purchase a not so high quality brush, there may be the chance that some bristles come loose during cleaning, and fall into the grill – and eventually onto food. The more preferred grill brush style nowadays is the non-bristle style brush which don’t have any bristles that can come loose. In this style the bristles are all curved into shape, and can scrape away and remove grease and dirt with ease, without coming loose and falling into the grill. Now we will take a look at a popular grill brush on the market – the Nylon Bristle Grill Brush by Char-Broil. Looking for a high quality and modern grill brush? The Nylon Bristle Grill Brush by Char-Broil is the perfect brush for your grill. We take a look at its key features below. Char-Broil specialize in grills and their accessories, and produce some good quality products. Their nylon bristle grill brush is no exception! And it is perfect for getting your grill squeaky clean. Cleaning grills can sometimes be quite tedious and with the wrong tools it almost seems impossible to get into those hard to reach spaces. With the Char-Broil brush, however, it is a lot easier! Thanks to the angled bristles, this little brush can clean more effectively and gets under those grates like nothing else. Sometimes you will find brushes that do not clean your grill effectively enough. Therefore, it is important to find a versatile brush which can clean various surfaces and materials. 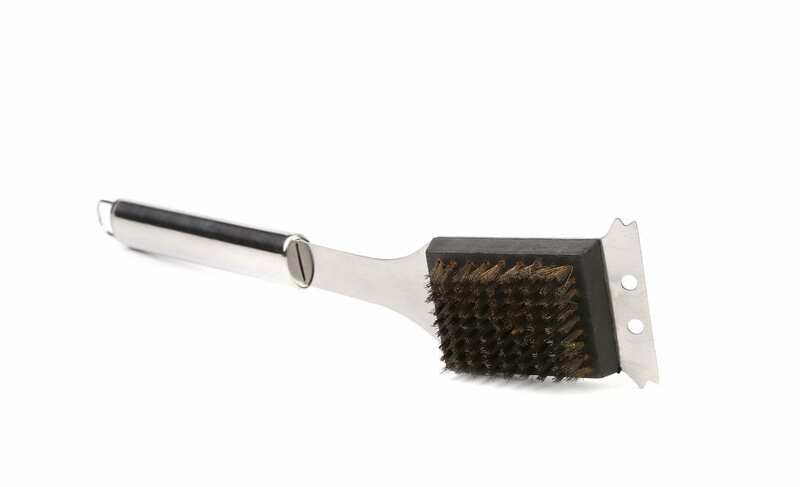 The Char-Broil bristle brush is ideal for cleaning porcelain grills, chrome wire grids and cast iron grates. It features a heavy-duty hook which can also double as a grid lifter and even an underwire scraper! When brushes wear out you will usually have to throw them out. 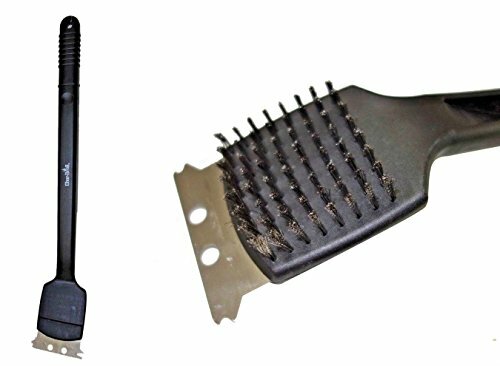 The Char-Broil brush, however, features a removable head which allows you to replace it when it eventually becomes worn out. The head can also be removed when it needs to be washed, and this can allow you to give it a deeper clean. The Char-Broil brush has been designed with strong nylon material, and is really comfortable to work with when cleaning. It fits softly in your hand and is not so difficult to use. This multi-blade scraper is also durable and is guaranteed to last for a good amount of time. If you enjoy regular grilling sessions, then keeping your grill clean is really important. The longer you leave your grill without cleaning, the more chances you risk danger as too much dirt build up can potentially cause a fire. Looking around grill specialists nowadays, a good quality grill brush is not hard to find, and you should be able to get one that will really clean your grill well. The Nylon bristle grill brush by Char-Broil is a good brush to go for, especially if you are a newbie to grilling as it definitely performs well and will really remove grease without any difficulties. We hope this article has given you some inspiration to find a new grill brush, and hope you will be grilling with a cleaner grill in 2019!